I’ve always been one of those people who has too many clothes. Since I can remember, it’s taken me too long to get ready in a morning because I can’t decide which top goes with which pair of jeans. Then do I want to wear pumps, heels, trainers? 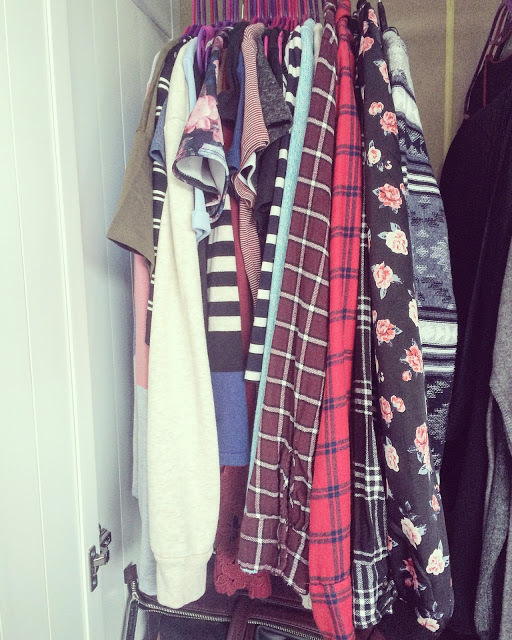 Dressing had become a chore until I discovered the holy grail: the capsule wardrobe. There are tonnes of guides online about how to set up a capsule wardrobe; many of which make you select a set number of items. Some include outerwear, some include accessories but for me, a capsule wardrobe is as personal as you can get. Yes, many people have got it down to a science but it’s their version, not everyone else’s. 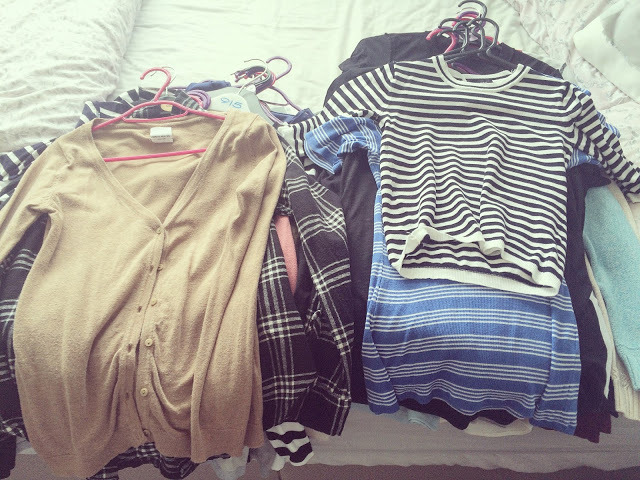 The basic idea is to pare down your wardrobe as much as you can and not buy any clothes for 3 months. Hard, I know, but it will save you so much money in the long run. I’ve come up with a step-by-step guide on how I’ve created my capsule wardrobe but if it’s not for you, switch it up! 1. Sort out your current wardrobe. Take everything out of your wardrobe. This will show you how much you have. In the picture below, you can see just how many items I have.! Clean your wardrobe before you do anything else. Leave the doors open, clean the interior and exterior (use a damp cloth or antibacterial spray) and whilst you’re at it, wipe down your mirrors! You don’t realise how dirty they are, trust me! Next, try on every single item that is there. If you know you don’t want to keep it, then don’t bother but you might be surprised when you see it on! Feel the material, see how the item fits and then make a decision. I set up two piles to start off with: yes and no. Do you love it? Does it fit? Will it go with more than one item in your wardrobe? Then it goes in the yes pile. If you haven’t worn it in over a year, it doesn’t fit or just isn’t your style anymore, it goes in the no pile. After trying on all clothing, I sort through the no pile first. I like to have three piles: throw away, to sell and to donate. I like to minimise throwing away as much as possible; the only things I throw away are items that are basically ruined. Anything that still has its tag attached to it or is really decent quality, I try to sell on eBay. Anything not sold after a couple of months gets donated to a local charity. I wish I could afford to donate all of my unwanted clothes; however, I need to make some money! It’s best to remove these items as quickly as possible from your house. Anything you’re donated, get it in a bag and take it straight to the charity shop. Whilst they’re out, take photos of your items to sell so you can upload them online as and when you can. After this whole process, I move onto shoes, bags and jewellery. Whilst you’re at it, you could sort through all of your drawers: underwear, PJs, workout gear. I feel so uplifted after I’ve had a wardrobe sort-out so I go into crazy mode and start rifling through everything! 2. Assess your current wardrobe. Once you’ve moved everything that you won’t be wearing out of the way, it’s time to look at what you have in closer detail. Separate your tops, bottoms, outerwear etc so you can see exactly how many items you have of each category. Look at the gaps you have: lack of basic t-shirts? No decent jeans at all? Jot these down! Search online for inspiration. My favourite place to look is on Pinterest; there are so many different images on there just by typing in ‘capsule wardrobe’! Have a look around the shops but DON’T BUY ANYTHING YET! At this stage, you’re looking for inspiration and ideas so take photos of anything you see that catches your eye, note down the prices and see if you can get any discount online. 3. Plan before you buy. My best advice when planning is to download this planner. 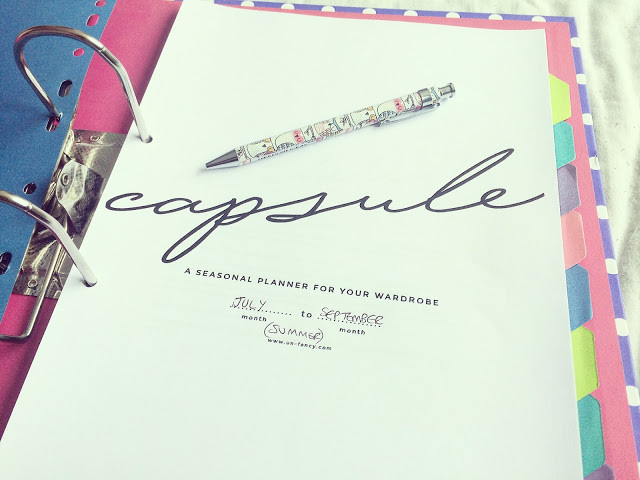 Seriously, this is the holy grail of capsule wardrobe planners. I’ve tried many (one was over 40 pages!) and this is the best one. I worked through this planner in an hour or so and felt so focused afterwards. Write lots of notes: what are your go-to pieces, what colours do you like the most, how do you spend your time? Make sure you create a wishlist of the items you want to add to your wardrobe and make sure to shop around. Set yourself a budget. This will depend on the season. Autumn tends to be an expensive season as you might be investing in boots, coats and jeans. Summer tends to be cheaper unless you literally have no summer clothing like me and live in black! The idea is to minimalise as much as possible. Many experts say to pick a number (37 or 50 are popular) but this number is personal preference. I’ve decided not to set a number this time and just focus on having a smaller selection of clothing. Again, whatever works for you is what you should do! For me there are a number of items that I don’t include: underwear, jewellery, coats/jackets, pyjamas, lazy-day clothes, work uniform, workout clothes or bags. Now comes the fun part: you get to shop ’til you drop and then you can plan a tonne of outfits knowing that you have a fully mix and match wardrobe! Next week, I’ll be sharing the items that I have in my autumn capsule wardrobe!